There’s a bit at the end of the first act of Parsifal where Gurnemanz looks at Parsifal and says “you haven’t understood anything have you?” or words to that effect. Watching Romeo Castellucci’s 2011 production for Brussels’ La Monnaie theatre my sympathy was very much with the Pure Fool. This is one of the most incomprehensible productions I have seen. Act 1 is very dark. Most of the time only a tiny fragment of the stage is lit. 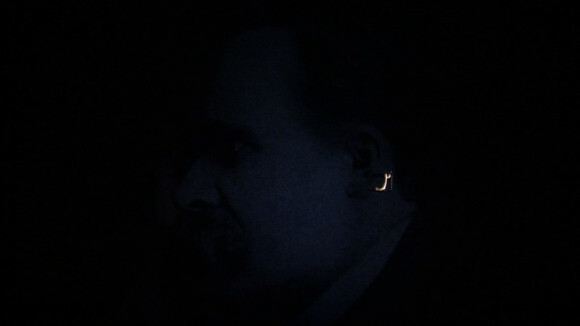 The first thing we see is a snake in its own tiny patch of light. Then we are in a forest and the Grail Knights appear to be part of the forest. Whether they are just wearing suits of leaves or are actually plants is unclear. Kundry, in a white hoodie, and Parsifal in street clothes are recognisably human. Titurel and his squires wear overalls and hard hats. One of them carries a chain saw. The “swan” appears to be a lit up tree branch though later it appears as a very decomposed skeleton. 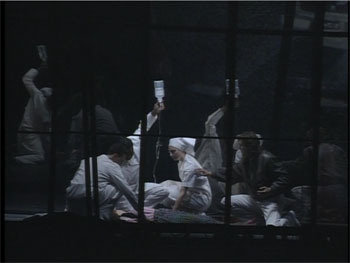 The Grail Scene is played out with a white curtain, with a small black comma on it, across the entire stage. The curtain is withdrawn and we see fluorescent lights above the greenery, which takes up much less space than one has so far imagined. Is Monsalvat a grow-op and the knights marijuana plants? Martin Kušej’s production of Der fliegender Holländer for De Nederlandse Opera recorded in 2010 is high concept and it’s worth looking at the interviews with the cast and conductor before watching the main event. Certainly the essay in the booklet will do little to prepare you. For Kušej, Daland’s ship is a cruise ship or pleasure yacht full of expensively dressed partygoers. The Dutchman’s “crew” are refugees or desperate economic migrants. The Dutchman himself has made his pile in human trafficking. The framework of the “outsiders” wanting a share of the “insiders'” goodies is the backdrop for the interpersonal drama of Senta, the Dutchman and Erik.